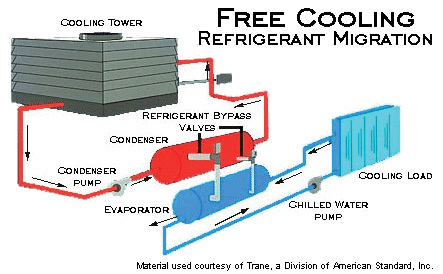 "Free Cooling" is the production of chilled water without operating the chillers. Free cooling is not really free as the chilled and tower water pumps and the tower fan(s) must operate. One method for reducing the energy consumption of a centrifugal water chiller is to add a refrigerant-migration free cooling cycle. This type of free cooling is based on the principle that refrigerant migrates to the coldest point in a refrigeration circuit. When water returning from the cooling tower is colder than the chilled water, refrigerant pressure within the condenser is lower than that in the evaporator. This pressure differential drives the refrigerant vapor "boiled off" in the evaporator to the condenser, where it liquefies and flows by gravity back to the evaporator. As long as the proper pressure difference exists between the evaporator and condenser, refrigerant flow and the consequent free cooling continues. Under favorable conditions, refrigerant-migration free cooling can provide as much as 40 percent of the chiller's design tonnage if the chiller is designed appropriately. Since the chiller and free cooling cycle cannot operate simultaneously, free cooling of this type can only be used when the cooling capacity of the tower water is sufficient to meet the entire building load. Little, if any, free cooling capacity is available when the ambient wet bulb temperature is above 50°F. Accessories such as chilled water pumps, condenser water pumps, and cooling tower fans continue to operate in the conventional manner while the chiller operates in the free cooling mode. The energy cost savings realized from free cooling operation results from the compressor's inactivity during this cycle. The cooling tower must be designed for winter operation. Like other methods of free cooling, the addition of a strainer-cycle waterside economizer is intended to reduce water chiller energy consumption. This particular method uses cooling tower water to satisfy the building's cooling load. Whenever the ambient wet bulb temperature is low enough, cooling tower water is "valved" around the chiller directly into the chilled water loop. The cooling tower water typically passes through a filter (or strainer) before entering the chilled water circuit. This is why it is commonly referred to as "strainer cycle." Pumping cooling tower water throughout the entire chilled water loop increases the risk of pipe corrosion and air handler coil plugging. This risk can be mitigated through more costly water treatment. 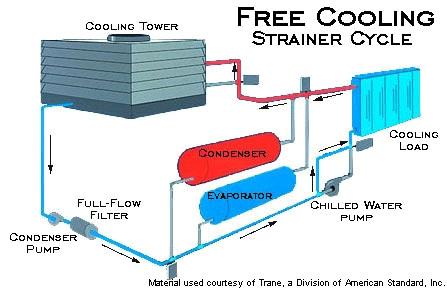 Strainer cycle economics are limited since free cooling is only available when the cooling load can be satisfied with cooling tower water. The cooling tower must be designed for winter operation. One method for reducing water chiller energy consumption is to add free cooling. 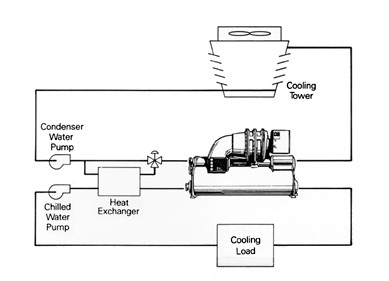 The method shown here uses a plate and-frame waterside economizer that pre-cools the chilled water before it enters the chiller's evaporator. When the ambient wet bulb temperature is low enough, the heat exchanger allows the transfer of heat from the return chilled water to the water returning from the cooling tower. Lowering the temperature of the water entering the evaporator reduces both chiller loading and energy consumption. 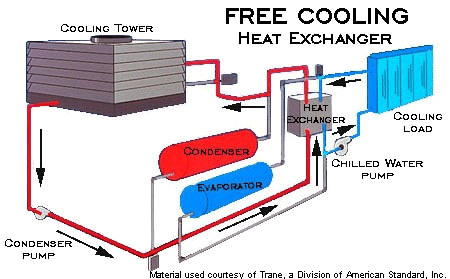 The plate-and-frame method of free cooling requires an additional heat exchanger. This adds to the initial cost of the system and increases pumping costs due to the added pressure loss. Free cooling is only of significant value when the ambient wet bulb temperature is lower than the design return chilled water by about 10°F. The cooling tower must be designed for winter operation, and the water entering the chiller condenser must be maintained within the manufacturer's specified temperature limits while the chiller is operating. Note that plate-and-frame free cooling can be accomplished with a variety of piping arrangements, depending on the operational characteristics desired. The schematic illustrated here shows just one method of piping that can be used to permit simultaneous free cooling and mechanical cooling.